For screen sizes (typically in inches, measured on the diagonal), see display size. For a list of particular display resolutions, see graphics display resolution. 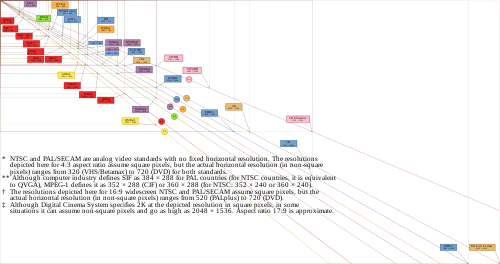 This chart shows the most common display resolutions, with the color of each resolution type indicating the display ratio (e.g. red indicates a 4:3 ratio). For device displays such as phones, tablets, monitors and televisions, the use of the word resolution as defined above is a misnomer, though common. The term "display resolution" is usually used to mean pixel dimensions, the number of pixels in each dimension (e.g. 1920 × 1080), which does not tell anything about the pixel density of the display on which the image is actually formed: resolution properly refers to the pixel density, the number of pixels per unit distance or area, not total number of pixels. In digital measurement, the display resolution would be given in pixels per inch (PPI). In analog measurement, if the screen is 10 inches high, then the horizontal resolution is measured across a square 10 inches wide. For television standards, this is typically stated as "lines horizontal resolution, per picture height"; for example, analog NTSC TVs can typically display about 340 lines of "per picture height" horizontal resolution from over-the-air sources, which is equivalent to about 440 total lines of actual picture information from left edge to right edge. Some commentators also use display resolution to indicate a range of input formats that the display's input electronics will accept and often include formats greater than the screen's native grid size even though they have to be down-scaled to match the screen's parameters (e.g. accepting a 1920 × 1080 input on a display with a native 1366 × 768 pixel array). In the case of television inputs, many manufacturers will take the input and zoom it out to "overscan" the display by as much as 5% so input resolution is not necessarily display resolution. Graphics wise, the input rate of resolution only changes frame rate by a little bit (e.g. 1080p - 720p = 5f). The eye's perception of display resolution can be affected by a number of factors – see image resolution and optical resolution. One factor is the display screen's rectangular shape, which is expressed as the ratio of the physical picture width to the physical picture height. This is known as the aspect ratio. A screen's physical aspect ratio and the individual pixels' aspect ratio may not necessarily be the same. An array of 1280 × 720 on a 16:9 display has square pixels, but an array of 1024 × 768 on a 16:9 display has oblong pixels. An example of pixel shape affecting "resolution" or perceived sharpness: displaying more information in a smaller area using a higher resolution makes the image much clearer or "sharper". However, most recent screen technologies are fixed at a certain resolution; making the resolution lower on these kinds of screens will greatly decrease sharpness, as an interpolation process is used to "fix" the non-native resolution input into the display's native resolution output. 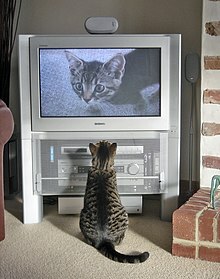 While some CRT-based displays may use digital video processing that involves image scaling using memory arrays, ultimately "display resolution" in CRT-type displays is affected by different parameters such as spot size and focus, astigmatic effects in the display corners, the color phosphor pitch shadow mask (such as Trinitron) in color displays, and the video bandwidth. Difference between screen sizes in some common devices, such as a Nintendo DS and two laptops shown here. As of July 2002[update], 1024 × 768 eXtended Graphics Array was the most common display resolution. Many web sites and multimedia products were re-designed from the previous 800 × 600 format to the layouts optimized for 1024 × 768. In 2010, 27-inch LCD monitors with the 2560 × 1440-pixel resolution were released by multiple manufacturers including Apple, and in 2012, Apple introduced a 2880 × 1800 display on the MacBook Pro. Panels for professional environments, such as medical use and air traffic control, support resolutions of up to 4096 × 2160 pixels. When a computer display resolution is set higher than the physical screen resolution (native resolution), some video drivers make the virtual screen scrollable over the physical screen thus realizing a two dimensional virtual desktop with its viewport. Most LCD manufacturers do make note of the panel's native resolution as working in a non-native resolution on LCDs will result in a poorer image, due to dropping of pixels to make the image fit (when using DVI) or insufficient sampling of the analog signal (when using VGA connector). Few CRT manufacturers will quote the true native resolution, because CRTs are analog in nature and can vary their display from as low as 320 × 200 (emulation of older computers or game consoles) to as high as the internal board will allow, or the image becomes too detailed for the vacuum tube to recreate (i.e., analog blur). Thus, CRTs provide a variability in resolution that fixed resolution LCDs cannot provide. As far as digital cinematography is concerned, video resolution standards depend first on the frames' aspect ratio in the film stock (which is usually scanned for digital intermediate post-production) and then on the actual points' count. Although there is not a unique set of standardized sizes, it is commonplace within the motion picture industry to refer to "nK" image "quality", where n is a (small, usually even) integer number which translates into a set of actual resolutions, depending on the film format. As a reference consider that, for a 4:3 (around 1.33:1) aspect ratio which a film frame (no matter what is its format) is expected to horizontally fit in, n is the multiplier of 1024 such that the horizontal resolution is exactly 1024•n points. For example, 2K reference resolution is 2048 × 1536 pixels, whereas 4K reference resolution is 4096 × 3072 pixels. Nevertheless, 2K may also refer to resolutions like 2048 × 1556 (full-aperture), 2048 × 1152 (HDTV, 16:9 aspect ratio) or 2048 × 872 pixels (Cinemascope, 2.35:1 aspect ratio). It is also worth noting that while a frame resolution may be, for example, 3:2 (720 × 480 NTSC), that is not what you will see on-screen (i.e. 4:3 or 16:9 depending on the orientation of the rectangular pixels). One of the drawbacks of using a classic television is that the computer display resolution is higher than the television could decode. Chroma resolution for NTSC/PAL televisions are bandwidth-limited to a maximum 1.5 megahertz, or approximately 160 pixels wide, which led to blurring of the color for 320- or 640-wide signals, and made text difficult to read (see second image to right). Many users upgraded to higher-quality televisions with S-Video or RGBI inputs that helped eliminate chroma blur and produce more legible displays. The earliest, lowest cost solution to the chroma problem was offered in the Atari 2600 Video Computer System and the Apple II+, both of which offered the option to disable the color and view a legacy black-and-white signal. On the Commodore 64, the GEOS mirrored the Mac OS method of using black-and-white to improve readability. The advantage of a 720 × 480i overscanned computer was an easy interface with interlaced TV production, leading to the development of Newtek's Video Toaster. This device allowed Amigas to be used for CGI creation in various news departments (example: weather overlays), drama programs such as NBC's seaQuest, The WB's Babylon 5, and early computer-generated animation by Disney for The Little Mermaid, Beauty and the Beast, and Aladdin. In the PC world, the IBM PS/2 VGA (multi-color) on-board graphics chips used a non-interlaced (progressive) 640 × 480 × 16 color resolution that was easier to read and thus more useful for office work. It was the standard resolution from 1990 to around 1996. The standard resolution was 800 × 600 until around 2000. Microsoft Windows XP, released in 2001, was designed to run at 800 × 600 minimum, although it is possible to select the original 640 × 480 in the Advanced Settings window. In this image of a Commodore 64 startup screen, the overscan region (the lighter-coloured border) would have been barely visible when shown on a normal television. The list of common display resolutions article lists the most commonly used display resolutions for computer graphics, television, films, and video conferencing. ^ "Screen resolution? Aspect ratio? What do 720p, 1080p, QHD, 4K and 8K mean?". digitalcitizen.life. 2016-05-20. Retrieved 2017-08-28. ^ a b Robin, Michael (2005-04-01). "Horizontal resolution: Pixels or lines". Broadcast Engineering. Archived from the original on 2012-08-15. Retrieved 2012-07-22. ^ "Higher screen resolutions more popular for exploring the internet according to OneStat.com". OneStat.com. 2002-07-24. Archived from the original on 2011-07-16. Retrieved 2012-07-22. ^ "Screen resolution 800x600 significantly decreased for exploring the Internet according to OneStat.com". OneStat.com. 2007-04-18. Archived from the original on 2011-07-16. Retrieved 2012-07-22. ^ "Higher screen resolutions more popular for exploring the internet according to OneStat.com". techpowerup.com. 2012-04-12. Retrieved 2016-01-22. ^ Nelson, J.R. (2010-07-27). "Apple Releases New Cinema Display: 27 inches, 2560 × 1440 Resolution". DesktopReview. Retrieved 2012-07-22. ^ "Apple announces iOS 6, MacBook with retina display at WWDC 2012". The Times of India. 2012-06-11. Retrieved 2012-07-22. ^ "Steam Hardware & Software Survey". Valve. Archived from the original on 2019-02-11. Retrieved 2019-02-11. ^ "Desktop Screen Resolution Stats Worldwide". StatCounter. Retrieved 2019-02-11.